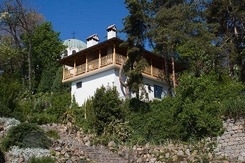 Location: Sandanski is situated 190 metres above the sea level, in the southwestern ridges of the Pirin Mountain, along the two banks of Sandanska Bistritsa River. 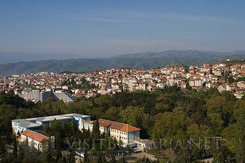 The town is located 166 km from Sofia and 74 km from Blagoevgrad. It is famous Bulgarian balneology and Spa resort, well-known for the curative power of its mineral springs. 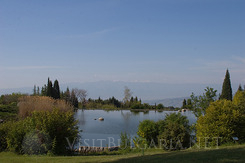 SPA: The resort has healthy climate and has attracted settlers since Antiquity. The mineral springs of Sandanski have temperatures ranging from 33 to 83 degrees Centigrade, which makes them appropriate for baths and even drinking. The town has nice luxurious hotels, offering spa and mineral water procedures for full relax. Sightseeing: Interesting to the visitors of the town is the Archeological Museum. It features valuable exhibits from a late Antiquity town of the 4th – 6th century. Other landmarks are Saint George Church, St.St. Kuzma and Damyan Monastery, Sandanski Art Gallery and the two plane trees. The trees are declared nature landmarks and are 500 years old, one of them being 25 metres high. Vicinities and Routes: Melnik, the smallest town in Bulgaria is situated just 20 km away from Sandanski. Melnik is famous for its thick aromatic red wines and the unique earth Melnik pyramids. “Slavianka” National reserve is also situated nearby. It is part of the National Park Pirin. The wonderful nature, the healthy climate and the mineral water springs definitely make Sandanski a nice SPA resort, perfect for a relaxing holiday.